For the second time this season, the St. Louis Rams made Seattle’s offensive line look like a waist-high picket fence, dismantling the Seahawks at home. RT Garry Gilliam said that the Seahawks offensive line was “flat” in the 23-17 home loss to the Rams Sunday. That adjective would more rightly belong to QB Russell Wilson, who was sacked four times and hit an additional 13 times, thanks to the Rams’ bullying pass rush. By the end of the game, it took two linemen just to peel Wilson off the turf; it was the least they could do. C Patrick Lewis had a rough day, blowing two shotgun snaps at opposite ends of the game that killed drives as much as sacks. In the first quarter, he gripped the ball too long and snapped it high. 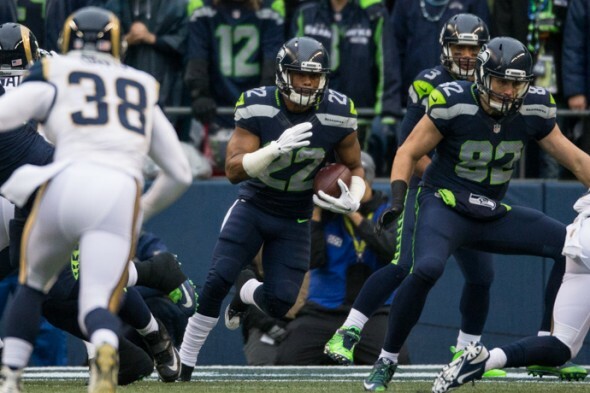 It was recovered by RB Christine Michael for a loss of six yards. Two plays later, SS Mark Barron forced a fumble from FB Will Tukuafu, allowing LB Akeem Ayers to scoop the ball and run back 45 yards for a touchdown. Lewis’s second miscue came midway through the fourth quarter, when he rolled a snap past Wilson for a loss of 15 yards, turning a manageable third-and-two into a fourth-down punt. After the game, Lewis was distraught, fighting back tears as he addressed members of the media. LG J.R. Sweezy dispersed the group momentarily, comforting his teammate. When Lewis resumed his interview, he was resolute. “I take full responsibility,” said Lewis. “I’ll go back to work. I might snap 100 balls tomorrow . . . we’ll get it fixed, together. Lewis said that the five-man rush from St. Louis’ defensive front didn’t fluster the group. The Rams, missing injured star rusher Robert Quinn, tore through the line, which was penalized five times for 43 yards, grabbing anything they could to slow down the rush. LT Alvin Bailey, starting in place of the injured Russell Okung, accounted for 23 of those yards with two false starts and a clipping penalty. The run game suffered, too. Seattle finished with 60 yards, well under its season average of 147.4. Seahawks coach Pete Carroll said problems started up front. “We didn’t block very well today,” said Carroll. “They had penetration and made some plays in the backfield early on. Credit is due the Rams line, currently stacked with four former first-round draft picks (DT Aaron Donald, DT Nick Fairley, DE Chris Long and DT Michael Brockers). Wilson spent more time running for his life rather than looking downfield. Between that pressure and the offensive blunders, the Seahawks shot themselves in the foot, Carroll said. “I’m not going to take anything away from them, they had a nice win today,” said Carroll. “However, we snapped the ball crazy, and we turned it over three times, and we had the penalties. The Seahawks line will look to get out of its own way when it travels to face the Arizona Cardinals for the regular season finale Sunday. The Cardinals sacked Green Bay’s Aaron Rodgers nine times en route to clinching a first-round bye Sunday with a 38-8 triumph. With no timetable on RB Marshawn Lynch’s recovery from abdominal surgery, it will be the line’s ability to recover that will determine if they spend the playoffs celebrating with their teammates, or scraping them off the ground. The offensive line was dealt another blow by the loss of TE Luke Willson, who was concussed in the second quarter after receiving a hit to the head from CB Trumaine Johnson. He was penalized 15 yards for the hit. Carroll said after the game that he did not yet know the severity of Willson’s injury. This has to be the Hawks’ worst performance of the year. You named the names, Art, as they deserved, so I’ll refrain. Even the chance to get payback for the loss to the Rams earlier in the season wasn’t enough motivation for the Hawks to play well. The O-line was several notches worse than abysmal. And the penalties were predictably killers. And in the 15th game of the season, they still got a delay-of-game penalty. Shish!!! Fullback Tukuafu was handed the ball from Wilson and fumbled after being hit at the line. This fumble 6 was the difference in the game. Correct. All the hits blurred into one big beating from up in the press box. Woops–I had the wrong author. Sorry about that, Mr. Harvey. Meaningless game. If anything this game shows the O-Line still has problems that need to be addressed in the offseason. The Hawks need to look at how they evaluate offensive linemen prospects. They bring in a number of them but don’t have the kind of success that they do at other positions.